2012 Citroen C1 prices announced | What Car? The 2012 Citroen C1 city car goes on sale in April. Until the end of the month, Citroen is offering a 1000 discount on all C1 models; meaning the entry point to the range is now the 6995 1.0 VT 3dr - 1700 cheaper than the previous model. Entry-level C1 VT versions come with with a CD player and an MP3 socket, while VTR models add daytime running lights, air-con and electric front windows. Prices start a 8995 for three-door models and 9345 for the five-door . 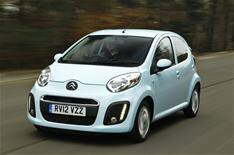 The C1 VTR+ models add alloy wheels, Bluetooth, foglights, leather steering wheel and tinted windows. The 3dr VTR+ costs 9695 and the 5dr 10,045. Elect 4 Personal Lease will sell you a C1 VTR from just 99 per month, including one years free insurance for 21-75 year olds. The Citroen C1 is closely related to the Peugeot 107, which also starts at 7995, and Toyota Aygo, which costs from 8495.